The number of Iraqi children who are born underweight or suffer from malnutrition has increased sharply since the US-led invasion, according to a report by Oxfam and a network of about 80 aid agencies. The report describes a nationwide catastrophe, with around 8 million Iraqis - almost a third of the population - in need of emergency aid. Many families have dropped out of the food rationing system because they have been displaced by fighting and sectarian conflict. Others suffer from the collapse in basic services caused by the exodus of doctors and hospital staff. Although the security crisis forced Oxfam and other agencies to withdraw their foreign staff from Iraq to Jordan within a year of the invasion, many Iraqi non-governmental organisations still work in the country and receive supplies from abroad. “The fighting and weak institutions mean there are severe limits on what humanitarian work can be carried out,” said Jeremy Hobbs, the director of Oxfam International, yesterday as the report, Rising to the Humanitarian Challenge in Iraq, was published. ….. Around 40% of Iraq’s teachers, water engineers, medical staff and other professionals have left the country since 2003. The Oxfam report comes as Unicef and the UN agency for refugees jointly appealed for $129m to help to get tens of thousands of uprooted Iraqi children back to school. Saying a generation of Iraqis could grow up uneducated and alienated, the agencies presented a plan to support Syria, Jordan, Egypt and Lebanon in providing schooling for 155,000 refugees. Altogether, more than 2 million Iraqis have fled to nearby countries. About 500,000 of them are of school age and most currently have limited or no access to education. One day, I was on my way to the University. That day I took the role of an escaped deer that runs from the wolves, who were men with masks. I thought they were trying to catch me! The wolves were riding old civilian cars and gesturing to me with their guns to stop, but as a movie heroine I refused to obey their orders and said to myself “I am dead anyway…. no way!!”. So I should die bravely like a heroine without giving up. Surrender will be useless. Suddenly and from nowhere there was a modern car that flew like a cheetah… Alas! It comes! It comes! And all is true! I heard the sound of bullets whizzing. So I hid my head down and pushed on the brakes. The end is come. I sniffed Death's odor. Moments later I realized that I am still alive; so I raise my head to face my fate. There was an Asian face with big mouth shouting back…back and a gun was directed to my face. Oh God, now I see they were not chasing me, only in my mind. They were foreign private security PSDs! And I was obstructing democracy and freedom that is already brought to us by force. "You should remove your plantation from my cattle" says the trespassing cattle heard in an old Iraqi proverb. Hundreds of Iraqis were killed because they found themselves – unfortunately, with the military troops or private security guards in same time and place; so they paid their lives as a price for this mistake. Can you imagine yourself participating in an epical or war movie? That's what's happening in Democratic Iraq when the new democracy and freedom entered Iraq on military tanks. I’m wondering when will the day come that we become part of romantic or social movie? By the way I forgot telling you that there is no difference between Saddam’s old movies and our new democratic movies - only the director. Iraq is facing a hidden healthcare and social crisis over the soaring number of amputations, largely of lower limbs, necessitated by the daily explosions and violence gripping the country. In the north of Iraq, the Red Crescent Society and the director general for health services in Mosul have told US forces, there is a requirement for up to 3,000 replacement limbs a year. If that estimate is applied across the country, it suggests an acute and looming long-term health challenge that has been largely ignored by the world. The revelation of the scale of limb loss suffered by Iraqi civilians is not entirely surprising, even though it has gone unreported. Levels of amputations performed by military surgeons on US troops in Iraq are twice as high as those recorded in previous wars: the most recently available figures suggest 6 per cent of wounded US troops require an amputation, compared with 3 per cent in other conflicts. Many Iraqis believe the dramatic escalation in U.S. military use of air power is a sign of defeat for the occupation forces on the ground. U.S. Air Force and Navy aircraft dropped five times as many bombs in Iraq during the first six months of this year as over the first half of 2006, according to official information. They dropped 437 bombs and missiles in Iraq in the first half of 2007, compared to 86 in the first half of 2006. This is also three times more than in the second half of 2006, according to Air Force data. The Air Force has also been expanding its air bases in Iraq and adding entire squadrons. It is now preparing to use a new robotic fighter known as the Reaper. The Reaper is a hunter-killer drone that can be operated by remote control from thousands of miles away. "We find it strange that the big strategists of the U.S. military have actually failed in finding solutions on the ground and are now back to air raids that kill more civilians than militants," former Iraqi army brigadier-general Ahmed Issa told IPS. "On the other hand, they are giving away the land to local forces that they know are incapable of facing the militants, who will grab the first chance of U.S. withdrawal to bases to hit back and hold the ground again." "Going back to air raids is an alarming sign of defeat," Salim Rahman, an Iraqi political analyst from Baghdad told IPS. "To bombard an area only means that it is in the hands of the enemy." "Our area is under threat of air raids all the time," Mahmmod Taha from the Arab Jboor area southwest of Baghdad told IPS. "Each time they bombed our area, civilians were killed by the dozens, and civilians' houses were destroyed. They could not fight the resistance face to face, and so they take revenge from the air." May 2007 was the most violent month for U.S. forces in Iraq in nearly three years, according to the U.S. Department of Defence. Housekeeper and mother of three Anisah Kaseb, 58, says the relentless violence in Iraq has damaged her family psychologically: Her younger son committed suicide and her daughter now requires psychological help. Widowed and dependent on her deceased husband’s pension, Kaseb tries to make some extra money by cooking for marriage parties or washing laundry at home. 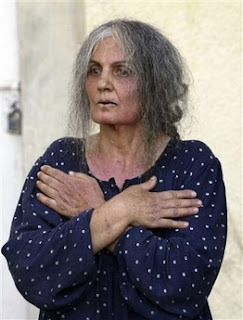 Her plight has worsened of late. “My son Muhammad, who was only 28 years old, was desperate: He had no job for the past two years and couldn’t marry because we didn’t have enough money. He was out on the streets one day looking for a job when a car bomb exploded near him. The incident affected him badly and he committed suicide, leaving us a letter saying that he couldn’t bear life in Iraq any more and felt useless because he could not help his family economically. “It was the most terrible day in my life. He killed himself on the day of his sister’s birthday on 14 May and since than my daughter Alia’a, 32, has tried to commit suicide twice, firstly by cutting her wrists and then by jumping in front of a car - which left her with a broken leg that required hours of surgery. “The violence pushed my son to suicide, and sometimes I think that if Alia’a kills herself, I would rather die too. I don’t have any other person to live for as my eldest daughter, Juan, is married and lives in Syria with her husband. Security forces in Dohuk city in the Kurdish Autonomous Region in the north of Iraq arrested 50 Kurds for waving the Iraqi flag to celebrate the victory of the Iraqi national football team, a police source said Monday. The source, who spoke on condition of anonymity, said, 'The Kurdish security forces seize anybody carrying the Iraqi flag, even for one hour.' The region's president Massoud al-Barzani had earlier ordered that the Kurdish flag would replace the Iraqi one in all the cities of the autonomous region. If 11 young men can instill national pride and a sense of unity by playing soccer, Iraqis are wondering why 275 politicians elected to steer Iraq to a brighter future cannot achieve the same result. School guard Zuhair Mohammed, 35, spent half his salary this month on Iraqi soccer jerseys, flags and music CDs about a team containing Shi'ite, Sunni Arab and Kurdish players. "I hope the unity, strength and courage of the team can inspire the politicians to stop pursuing personal ambitions for the general interest," Mohammed said. "But I'm not raising my hopes." The soccer triumph was even more remarkable because players had only two months to come together under a foreign coach and had to endure logistical mishaps as well as the death of the team physiotherapist in a bombing weeks before the first match. Two of the team's top players had relatives murdered before the tournament in the sectarian mayhem engulfing their country. Baghdad was once one of the great cradles of Jewish culture and wisdom, but now, according to the Christian priest who has been looking after them, there are only eight Jews left in the Iraqi capital, and their situation is "more than desperate." The Rev. Canon Andrew White, the Anglican chaplain to Iraq, says that the small group is in considerable danger. However, the community has been unable to agree to emigrate as a whole. Some of its members, without identifying themselves as Jews, have attempted to leave individually, but have been turned down. White says that only one of the Jews, a woman, still regularly goes to a Baghdad synagogue, though he will give no details. According to recent research, the water in the Tigris and Euphrates rivers, which contains the principal nutrients that would benefit the marshland ecosystem, flows to the sea without these nutrients exploited to revive the remaining parts of the marshes. Areas that could be served by these water-borne nutrients are located especially in the marshlands west of the Tigris in Maysan province, as well as in the basin linking the marshes of Amiriya and Nasiriya, and in the al-Himar al-Kabir marsh. In addition, as temperatures rise, more and more water in the marshlands is lost to evaporation without replacement. Most of the water levels in these areas are in fact becoming shallower. Most disappointing is that the flow of the two major rivers is actually at a very high level right now, which, if it were exploited, could restore the entire Iraqi marshland. 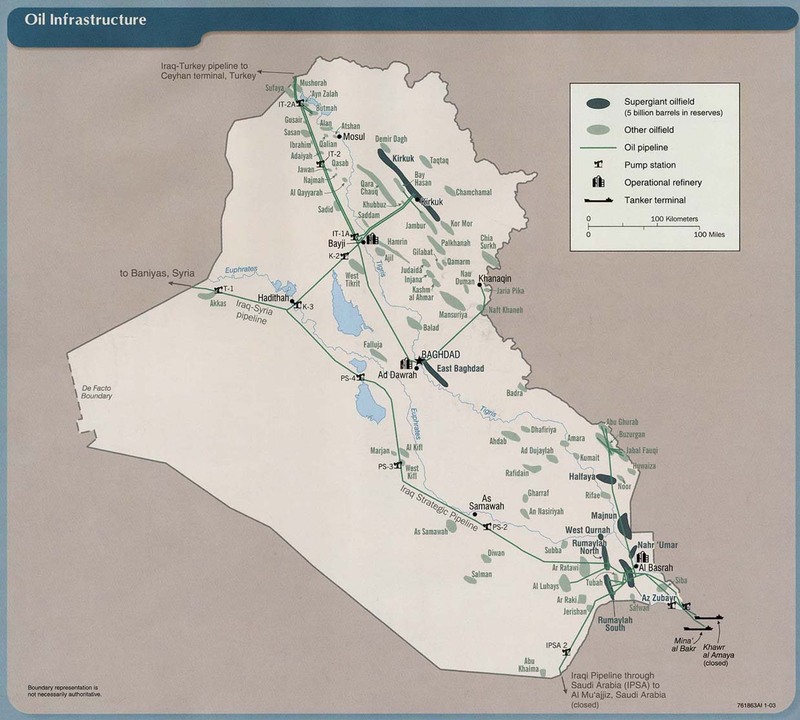 Yet planning by the relevant ministries has not been at the level required in order to employ Iraq’s water resources to the benefit of the marshlands. Despite this disheartening reality, the Water Resources Ministry still takes pride in its achievements -- achievements that appear on paper only. The leader of Iraq's Kurdish region warned Tuesday of a "real civil war" if the central government does not implement a constitutional clause on the future of Kirkuk, the oil-rich city claimed by the Kurds. 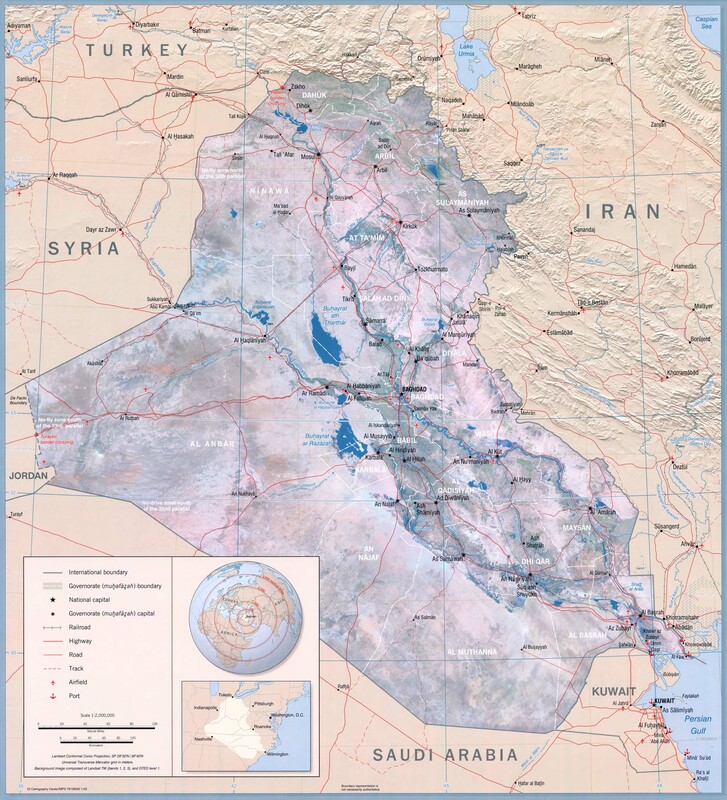 Control over Kirkuk and the surrounding oil wealth is in dispute among the city's Kurdish, Arab and ethnic Turkish populations. Nationally, the dispute pits the Kurds, who want to annex it to their autonomous region in northern Iraq, against the country's Arab majority and its small minority of Turks, known locally as Turkomen. Massoud Barzani, speaking in an interview with U.S.-funded Alhurra television, complained that the Baghdad government was dragging its feet on holding a referendum that could put Kirkuk under control of the autonomous Kurdish region in northern Iraq. "There is procrastination (by the government) and if this issue is not resolved, as I said before, all options are open. ... Frankly I am not comfortable with the behavior and the policy of the federal government on Kirkuk and clause 140," he said. The Pentagon "cannot ensure that U.S.-funded equipment has reached Iraqi security forces," according to a new report from the Government Accountability Office. Not only did Multinational Security Transition Command-Iraq (MNSTC-I) fail to "maintain a centralized record of all equipment distributed to Iraqi forces before December 2005." But there's "a discrepancy of at least 190,000 weapons between data reported by the former MNSTC-I commander and the property books," too. Iraq's biggest Sunni Arab group accused Shi'ite Prime Minister Nuri al-Maliki on Monday of pushing it out of the government by failing to consult it on key issues, escalating a row that threatens reconciliation efforts. The Sunni Accordance Front has threatened to pull out of Maliki's shaky coalition government this week unless he meets a list of demands, including a greater say in security matters. It comes at a time when Washington is pushing Iraq's leaders to work together to push through a package of reforms aimed stabilising the country and reconciling Iraqis. Parliament decided on Monday to go on summer recess until early September. "He (Maliki) is simply closing the doors on reforms and therefore the Front will be excused if it goes ahead with its plan to withdraw from the government in the time it has set," the Front said in a statement. Iraq's archaic system for supplying and sustaining its troops on the battlefield is a major hurdle in the U.S. effort to fashion an independent Iraqi fighting force, according to a top American military commander. Marine Corps Maj. Gen. W.E. Gaskin said there has been substantial progress in Iraq's ability to recruit and train its military. But those positive steps have not been matched by badly needed improvements to the country's outdated network for maintaining and repairing critical war-fighting gear. "Realistically, if things are going the way they're going now, you'd say a year from now the Iraqis training-wise would be ready to do the types of operations we expect of them," Gaskin said Monday in a telephone interview with The Associated Press. "I am not as optimistic about them being able to fix the logistics system." An Iraqi man alleges he was betrayed after helping British intelligence officials who handed him to U.S. CIA agents for torture in a secret prison.Bisher al-Rawl said he was double-crossed by Britain's MI5 despite having helped track Abu Qatada, the Muslim cleric accused of being Osama bin Laden's "ambassador" in Europe, The Observer reported Sunday. Al-Rawl told The Observer he was kidnapped, stripped naked, shackled and blindfolded before being strapped to a stretcher and flown in 2002 to a secret CIA prison near Kabul in Afghanistan, where he was tortured. Al-Rawl then allegedly was jailed at Guantanamo Bay in Cuba until last March, when he was released and returned to Britain without a charge being filed against him. The paved road runs out about 10 miles from the Iranian border, and so does the authority of the Iraqi government. High in the jagged peaks above lies territory controlled by a radical band of Kurdish leftists that has emerged as the latest threat to the region's imperiled stability. At the last Iraqi border checkpoint, a squat gray castle flanked by fields of sunflowers and melons, Col. Ahmed Hamid warns travelers that he can't guarantee their safety. "If anything happens to you, the Iraqi government is not responsible," he cautions. "There could be bombing, and there are terrorists everywhere." ……In response to a recent surge of PKK attacks, Turkey has massed up to 140,000 troops along the Iraq border. They have fired periodic bursts of artillery toward remote villages on the Iraqi side and threatened to launch military action unless the PKK halts its attacks. Iran also has been reinforcing its side of the border to deter attacks by a PKK-affiliated Iranian Kurdish group. The Iranians also have been shelling the area, most recently on July 22, local villagers say. Since a U.S. warplane flew over it a little over a week ago, the Iranians have bolstered their positions in the area with 2,000 more men, according to Hamid, though he said he thinks the Iranian move is defensive. "They don't want Kurds escaping into Iran if Turkey attacks the area," he said. 'Further modernising the Egyptian and Saudi Arabia Armed Forces and increasing inter-operability will bolster our partners' resolve in confronting the threat of radicalism and cement their respective roles as regional leaders in the quest for Middle East peace and in ensuring Lebanon's freedom and independence,' she added. ….Under the arms-for-allies plan, the U.S. would provide 13 billion dollars in aid over 10 years -- roughly the same amount that it has been getting for most of the past decade. While precise figures have not been released, State Department officials said Saudi Arabia and its allies in the Gulf Cooperation Council (GCC) will be encouraged to buy some 20 billion dollars in new arms, including satellite-guided bombs, missile defences, and upgrades for its U.S.-made fighter-jets over the same period. To dampen concerns by Israel and its supporters here, the administration is also proposing a 10-year, 30-billion-dollar package to preserve the Jewish state's military superiority -- or 'qualitative edge' -- over its Arab neighbours. That would amount to a 25 percent increase in U.S. military assistance to Israel over current levels. …..The proposed arms sales and aid to the 'moderate' Arab states mark yet another step toward its renewed embrace of the Sunni Arab authoritarian regimes that the Bush administration and its neo-conservative backers had tried to distance themselves from in the aftermath of the 9/11 attacks in 2001, and particularly after the 2003 invasion of Iraq. The US seeks to arm the Saudis and others against Iran and Syria as America's man at the UN says half the insurgents entering Iraq come from Saudi Arabia. Never before have the US secretary of state and the defence secretary, undertaken this kind of joint trip anywhere. It shows how seriously they take the need to try to reshape the balance of power in the Middle East. …… The $20bn will be spread over 10 years. It'll go to Arab states seen as allies of the US, in contrast to Iran and Syria. The bulk of it will go to Saudi Arabia though five other gulf states will each get a share as well. It'll pay for new or upgraded military hardware including air-to-air missiles, advanced precision-guided bombs, fighter planes and naval ships. And to ease Israeli concerns over all this going to Arab countries, the US is to increase military aid to Israel by 25 per cent - to $30bn dollars. While Israel's friend and neighbour Egypt receives a further $13bn for weaponry. Nearly 2 million "externally displaced" Iraqis have crossed the borders into neighbouring Syria and Jordan over the last four years. The large increase in the populations of the two countries has strained health, education, water and other systems. The International Federation of Red Cross and Red Crescent Societies is supporting the Syrian Arab Red Crescent and the Jordan National Red Crescent Societies in their efforts to meet the health and psychological needs of one of the largest wave of refugees in decades. In an effort to provide assistance to Iraqi refugees in the two countries, the International Federation is supporting Jordan and Syrian Red Crescent Societies' efforts to expand their health and medical capacities to relieve some of the pressure exerted on health services. The two National Societies are also working in cooperation with United Nations agencies, local and international NGOs. The first of 5 new health care clinics is expected to open in the coming weeks in a poor neighbourhood in Amman where large concentrations of Iraqis reside. In addition to basic health services, the urban clinic will offer dental treatment and laboratory services. It will be able to transfer patients to the nearby Jordan Red Crescent hospital for more advanced treatment. Other programmes are already underway by the two National Societies. Iraq Moratorium Day – September 21 and every third Friday thereafter ~ "I hereby make a commitment that on Friday, September 21, 2007, and the third Friday of every subsequent month I will break my daily routine and take some action, by myself or with others, to end the War in Iraq." 1) MNF-Iraq is reporting the death of a Marine from enemy action in Al Anbar Province on Monday, July 30th. #1: six people were wounded when a roadside bomb blew up at about 8:15 a.m. near an Iraqi Army vehicle in the 14th Ramadan Street in Baghdad's western neighborhood of Mansour. The explosion was instantly followed by heavy gunfire between anonymous gunmen and Iraqi soldiers, the source added. A bomb targeting an Iraqi army patrol killed one soldier and wounded seven, a hospital source said. Police said the only casualties in that incident were six wounded civilians. #2: Another bomb explosion missed a US patrol in al-Jadidah region southeast of Baghdad in the morning, leaving three civilians wounded, the source said. #3: A U.S. helicopter went down Tuesday after coming under fire in eastern Baghdad, and the crew members were safely evacuated, the military said. The AH-64 Apache helicopter made a precautionary landing after facing ground fire east of the predominantly Shiite New Baghdad district, according to a statement. #4: Gunmen killed an engineer who was repairing the famous Sarafiya Bridge, damaged by a bomb in April, near his home in northern Baghdad, police said. #6: Around 9.20 am, a roadside bomb exploded at Palestine street targeting an joint troops (American and Iraqi) injuring two Iraqi policemen. #7: Around 10.15 am, a roadside bomb targeted an American patrol at Zayouna neighborhood (east Baghdad) . No casualties reported. #8: Around 10.30 am, a roadside bomb targeted an American patrol at Zayouna neighborhood (east Baghdad) injuring one resident. #9: Police patrols found on Monday 25 unidentified bodies dumped in different parts of the Iraqi capital Baghdad, a security source said. #1: Police retrieved the bodies of six people, shot and tortured, from the Tigris River in the city of Kut, 170 km (100 miles) south of Baghdad, and in the town of Suwayra, 40 km (25 miles) south of the capital, police said. #1: Pharmacists in the southern city of Basra went on strike after gunmen kidnapped the head of their syndicate on Monday, the Basra health directorate said. #1: An unmanned U.S. drone also crashed late Monday while landing at an air base north of Baghdad but it did not appear to be from hostile activity and no casualties were reported, the military said separately. An MQ-1 Predator unmanned aerial vehicle crashed at the end of the runway while landing at approximately 11 p.m. local time July 30 at Balad Air Base. #1: After 15 minutes of Monday mid-night , clashes took place at Rizgari area in Altoun Copry neighborhood north of Kirkuk injuring one resident who was transferred to Kirkuk hospital. #1: Around 8.45 am of Monday morning, gunmen opened fire on woman teacher Shourja neighborhood near Ameen building in downtown Kirkuk killing her at once. #2: Around 10 am, a roadside bomb exploded at Al-Hajaj neighborhood near Khansaa elementary school in downtown Kirkuk targeting a police patrol of Irouba police station injuring two policemen and one civilian who was near the explosion scene . #3: Around 11.40 am, gunmen riding a sedan car (Toyota, Mark model) opened fire randomly on people at Al-Atba’a Street in Hawija killing two brothers. #4: Around 11.45 am, gunmen opened fire on an employee of he new Iraqi army on the way between Kirkuk –Mosul near Sirkran check point ( north of Kirkuk city) injuring the employee who was taken to hospital for treatment. Around 1.20 pm, gunmen riding a sedan car ( Opel model) opened fire on the mayor of Siray neighborhood in Hawija in the big market of the city near the power department killing him after suffering from serious injury . #5: Monday night, gunmen killed a teacher while he was doing shopping in Hawija market ( west Kirkuk) while he was from Tareeq Baghdad neighborhood in downtown Kirkuk. #1: A Marine assigned to Multi National Force-West died July 30 while conducting combat operations in Al Anbar Province. #2: Dozens of Iraqis were transferred to hospitals in the capital of Anbar province after eating suspected toxic foodstuffs distributed as part of relief efforts, a provincial police source said on Tuesday. "Dozens of families in Ramadi, and five other nearby towns, were transferred to hospitals on Monday after apparently being poisoned by toxic foodstuffs," the source told Xinhua on condition of anonymity. The relief foodstuffs had been distributed by unknown groups of men to poor families earlier in the day in the violence-laden province, the source said. The exact number of victims were not available yet, said the source, adding that some of the victims were in critical conditions. #1: A suicide car bomber blew himself up near a convoy of U.S. troops on the outskirts of Kabul on Tuesday, leaving up to seven civilians and three soldiers wounded, officials said. The Taliban claimed responsibility. In the aftermath of the attack, U.S. troops opened fire on police arriving at the scene, killing one policeman, officials and a witness said. The bomber targeted the convoy outside Camp Phoenix, a U.S. base on Jalalabad road - an area frequently targeted by suicide bomb attacks. A statement from the U.S.-led coalition said three Afghan civilians and three coalition service members were wounded. Lt. Cmdr. Brenda Steele, a spokeswoman for NATO forces, said one foreign soldier suffered minor injuries in the attack and seven civilians were wounded. She would not disclose the nationality of the wounded soldier. The differing casualty figures could not immediately be reconciled. #2: in southern Kandahar province, the Taliban attacked a police checkpoint Monday night in Maiwand district, and the ensuing two-hour gun battle left three Taliban dead, including a senior commander, said provincial police chief Syed Agha Saqib. He said the police suffered no casualties. #3: Also Monday in northern Kunduz province, a suicide bomb attack killed one employee of the intelligence service, and wounded eight civilians, a policeman and three other intelligence personnel, the Interior Ministry said Tuesday in a statement. #4: A roadside bomb wounded six paramilitary troops on Tuesday as they delivered food to colleagues in Pakistan’s troubled tribal belt near the Afghan border, officials said. The troops’ vehicle had just entered the rugged South Waziristan tribal zone “and was distributing rations at a checkpost when it hit an improvised explosive device,” local police official Mumtaz Zareen told AFP. Security officials said two soldiers were seriously injured and four others suffered minor wounds in the blast near the town of Tank. #5: Earlier troops traded gunfire with pro-Taleban militants in the neighbouring region of North Waziristan after rebels launched rockets at government and army buildings, officials said. There were no immediate reports of casualties. #6: One rocket damaged a government-run student hostel in Miranshah, the main town in North Waziristan, while two landed on the lawns of the main military base in the town, local security officials said. More photos here, a video Iraqi football fans in the Jordanian capital are seen chanting, "With our spirits and blood, we sacrifice ourselves for you, Saddam," as they celebrate the Iraqi team's victory in the Asian Cup finals. Some photos from inside Iraq. DID YOU LEARN THE LESSON? Dear politicians - Words can never describe how grateful we are because our great heroes the Iraqi national soccer team made a miracle by winning Asia Championship. Maybe only the prayers of the widows and orphans of Iraq whom you brought joy to their hearts, maybe their prayers that Allah keeps you safe and blessed can give you your rights, its not the financial rewards of the Prime Minister or the President that give you your rights. The most important thing our national team did is giving you an important lesson about the most important subject in the school of life. The lesson was (how to be A Real Iraqi). They worked together. We didn’t have 11 players in the field, we had only one player but with 11 bodies. This great player fought like a real lion and like real eagle. He controlled the ground and the sky and captured happiness in spite of his wounds. It was hard job but the Iraqi brave knight accomplished the mission successfully because this knight carries deep in his pure heart the tears of all the widows and all the orphans, the grief of all the old men and more than that, this honest knight carries the hopes of all the honest real Iraqis. This is the lesson I talk about and I hope that you (our politicians) who watched the match and rewarded the knight, I hope you understand the lesson very well and try to pass the exams you have. The political crisis is not more than an exam and you are failures until this moment. I hope you study the lesson of the Iraqi national team again and try hard to pass this final exam. MAY ALLAH BLESS YOU OUR GREAT YOUNG MEN. It is dawn now, every one is asleep and I can not sleep. It is tears of joy not for winning the championship but for the men who played against all odds to bring joy to the sad widows, orphans and the wounded country. I am proud of you my brothers, all your people are proud of you. Thanks for every one of you who supported the team. Iraq's people were poor and lacked most of the normal signs of development, even before the fall of Saddam Hussein. Then it was possible to blame the problems of dictatorship and international sanctions, but since the US-led invasion continuing poverty in this oil-rich state has had other causes. A new report by Oxfam says that the continuing failure to provide even the most basic services to many Iraqis will not only cause continuing suffering, but "serve to further destabilise the country". Oxfam are unable to work on the ground in Iraq in the way that they would elsewhere, but working with the NGO Co-ordination Committee in Iraq (NCCI), their new survey finds "eight million people in need of emergency aid". The survey recognises that armed violence is the greatest threat facing Iraqis, but finds a population "increasingly threatened by disease and malnutrition". Economic mismanagement and corruption in Iraq have been uncovered in a report by the US agency overseeing reconstruction in the country. Special Inspector General for Iraqi Reconstruction Stuart Bowen explains the report's findings. Said Arikit, a spokesman for the UN mission in Iraq, told Al Jazeera the report painted a "grim picture". "Many of the figures and percentages in the report were actually derived from UN sources… so we concur with the findings," he said. "The government of Iraq is definitely the authority in Iraq and it bears responsibility for the welfare of its people." Iraqi services have been left in crisis as most of those seeking refuge are professionals, according to the report. "The 'brain drain' that Iraq is experiencing is further stretching already inadequate public services, as thousands of medical staff, teachers, water engineers, and other professionals are forced to leave the country," it said. The entry of Iraqi refugees to neighbouring countries has placed a growing strain on health, education and social services in the two countries. Iraq's parliament adjourned Monday for an August recess without receiving from the government a series of U.S.-backed draft laws designed to promote national unity and stem support for the Sunni-led insurgency. Speaker Mahmoud al-Mashhadani closed the three-hour session without a quorum present and declared it would not resume work until Sept. 4. Legislators blamed the government of Shiite Prime Minister Nouri al-Maliki for failing to construct compromise versions of the key pieces of legislation such as the so-called oil law, intended to ensure a fair distribution of Iraq's considerable oil wealth. ``We were supposed to discuss important issues in the month of July, but we did not. Sitting in August is unconstitutional and even if we sit next month, that's no guarantee that the important business will be done,'' said Mahmoud Othman, a prominent Kurdish lawmaker. 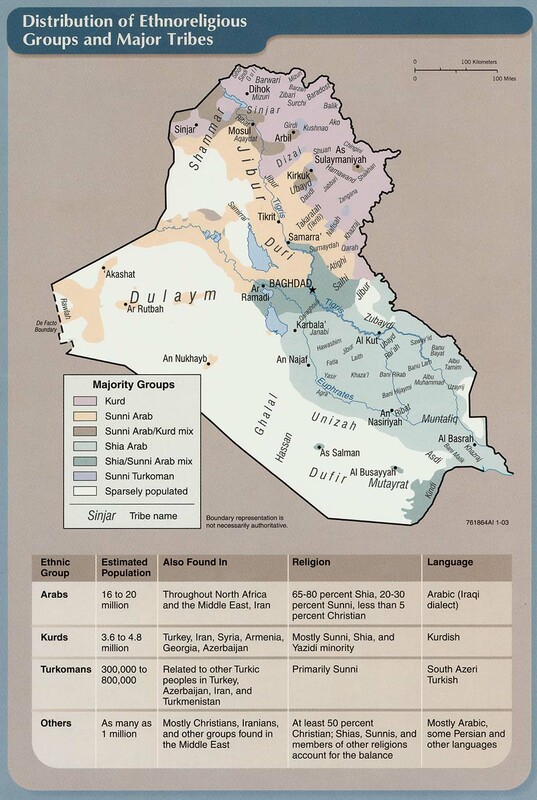 ``There are Iraqi-Iraqi and Iraqi-American differences that have not been resolved. The government throws the ball in our court, but we say that it is in the government's court and that of the politicians. They sent us nothing,'' he said. This is Iraq's Ministry of Interior — the balkanized command center for the nation's police and mirror of the deadly factions that have caused the government here to grind nearly to a halt. The very language that Americans use to describe government — ministries, departments, agencies — belies the reality here of militias that kill under cover of police uniform and remain above the law. Until recently, one or two Interior Ministry police officers were assassinated each week while arriving or leaving the building, probably by fellow officers, senior police officials say. That killing has been reduced, but Western diplomats still describe the Interior Ministry building as a "federation of oligarchs." Those who work in the building, like the colonel, liken departments to hostile countries. Survival depends on keeping abreast of shifting factional alliances and turf. On the second floor is Gen. Mahdi Gharrawi, a former national police commander. Last year, U.S. and Iraqi troops found 1,400 prisoners, mostly Sunnis, at a base he controlled in east Baghdad. Many showed signs of torture. The interior minister blocked an arrest warrant against the general this year, senior Iraqi officials confirmed. The third- and fifth-floor administrative departments are the domain of Prime Minister Nouri Maliki's Islamic Dawa Party, a Shiite group. The sixth, home to border enforcement and the major crimes unit, belongs to the Badr Organization militia. Its leader, Deputy Minister Ahmed Khafaji, is lauded by some Western officials as an efficient administrator and suspected by others of running secret prisons. The seventh floor is intelligence, where the Badr Organization and armed Kurdish groups struggle for control. The ninth floor is shared by the department's inspector general and general counsel, religious Shiites. 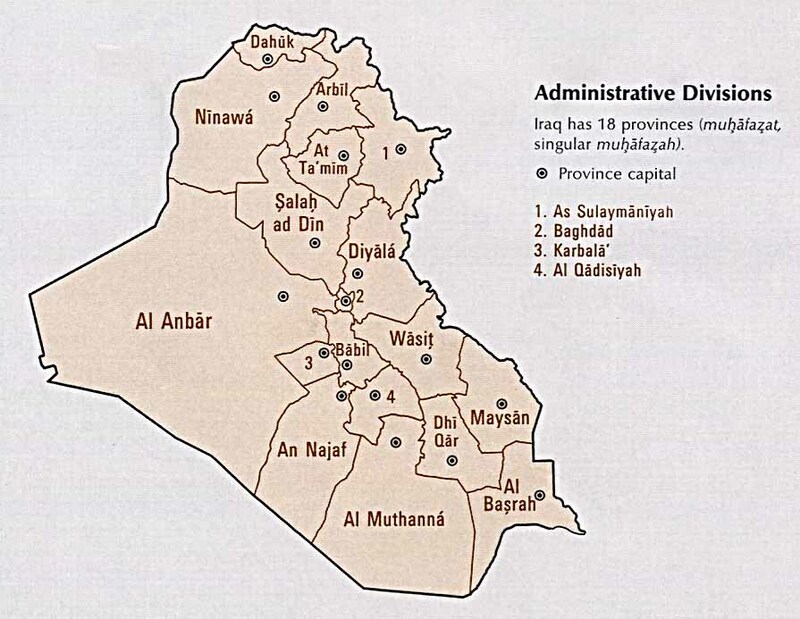 Their offices have been at the center of efforts to purge the department's remaining Sunni employees. The counsel's predecessor, a Sunni, was killed a year ago. Two thousand Iraqis are fleeing their homes every day. It is the greatest mass exodus of people ever in the Middle East and dwarfs anything seen in Europe since the Second World War. 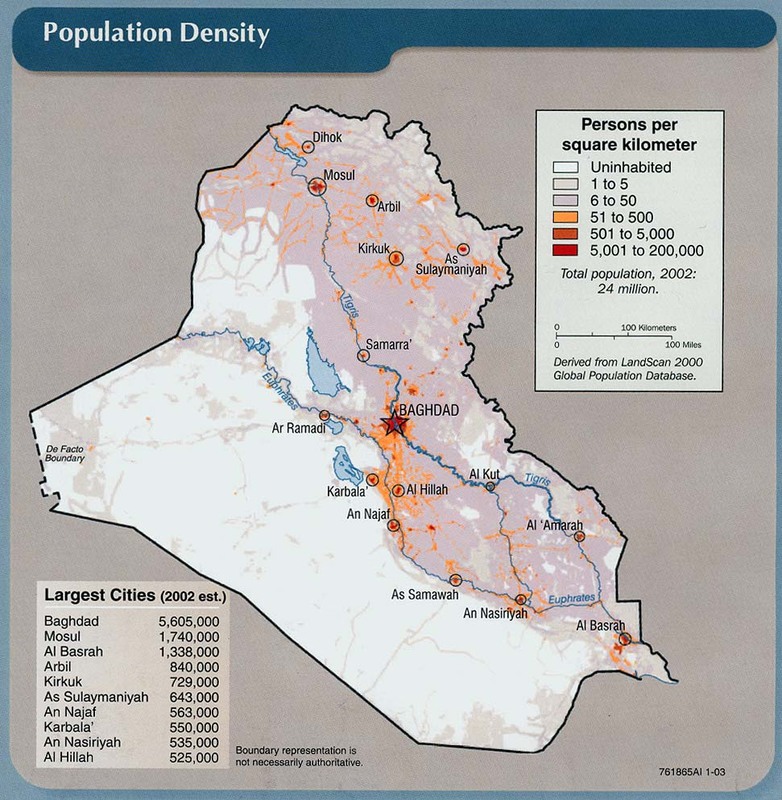 Four million people, one in seven Iraqis, have run away, because if they do not they will be killed. Two million have left Iraq, mainly for Syria and Jordan, and the same number have fled within the country. Yet, while the US and Britain express sympathy for the plight of refugees in Africa, they are ignoring - or playing down- a far greater tragedy which is largely of their own making. The US and Britain may not want to dwell on the disasters that have befallen Iraq during their occupation but the shanty towns crammed with refugees springing up in Iraq and neighbouring countries are becoming impossible to ignore. Even so the UNHCR is having difficulty raising $100m (£50m) for relief. The organisation says the two countries caring for the biggest proportion of Iraqi refugees - Syria and Jordan - have still received "next to nothing from the world community". Some 1.4 million Iraqis have fled to Syria according to the UN High Commission for Refugees, Jordan has taken in 750 000 while Egypt and Lebanon have seen 200 000 Iraqis cross into their territories. ….. Kalawar is a horrible place. Situated behind a petrol station down a dusty track, the first sight of the camp is of rough shelters made out of rags, torn pieces of cardboard and old blankets. The stench is explained by the fact the Kurdish municipal authorities will not allow the 470 people in the camp to dig latrines. They say this might encourage them to stay. ….. Asked to list their worst problems Mr Nayef said they were the lack of school for the children, shortage of food, no kerosene to cook with, no money, no jobs and no electricity. The real answer to the question is that the Arabs of Kalawar have nothing. They have only received two cartons of food each from the International Committee of the Red Cross and a tank of clean water. ….. Governments and the media crudely evaluate human suffering in Iraq in terms of the number killed. A broader and better barometer would include those who have escaped death only by fleeing their homes, their jobs and their country to go and live, destitute and unwanted, in places like Kalawar. The US administration has 18 benchmarks to measure progress in Iraq but the return of four million people to their homes is not among them. Syria's minister of health said providing free medical care to the over 1.5 million Iraqi refugees in Syria is costing the country around US$60 million a year, a burden he criticised the international community for failing to take responsibility for. "It was the duty of the international community to take the initiative long before now to stop the suffering of our Iraqi brothers," said Maher Housami, speaking on 30 July at the end of a two-day conference in Damascus organised by the World Health Organization (WHO) to address the health crisis among Iraqi refugees' displaced by the four-year-old US-led invasion. The WHO conference, attended by the health ministers of Syria, Jordan, Iraq and Egypt, as well as WHO and UN officials, met to discuss Iraqi refugees' access to health care in Syria and the need to formulate a plan to counter the strain being placed on the national health system. Housami expressed his disappointment that the USA had not provided countries in the region, particularly Syria and Jordan - who between them currently shelter an estimated 2.25 million Iraqi refugees - with greater financial support. Children are nearly always cited as the most desperate group in any refugee crisis. They are also, unfortunately, too often depicted in archetypal photos, too simplistic to depict the reality of the crisis. This week Hayder Fahad speaks with several Iraqi children living in Syria about their experiences in Syria and Iraq and their expectations for the future. JAKARTA, Indonesia - Iraq won the Asian Cup for the first time Sunday, a beacon of hope for a nation divided by war. Iraq's 1-0 victory over Saudi Arabia on a 71st-minute header by captain Younis Mahmoud was an inspirational triumph for a team whose players straddle bitter and violent ethnic divides. After the game, Mahmoud called for the United States to withdraw its troops from his nation. "I want America to go out," he said. "Today, tomorrow, or the day after tomorrow, but out. I wish the American people didn't invade Iraq and, hopefully, it will be over soon." "I don't want the Iraqi people to be angry with me," he said. "If I go back with the team, anybody could kill me or try to hurt me." (2) The British Ministry of Defense has issued a brief statement announcing the death of a British Royal Marine in combat operations in southern Afghanistan on Sunday, July 29th. #1: At least six people have been killed and more than 30 others injured in a suspected bomb attack on a minibus in Baghdad today. The minibus was one of several waiting for passengers heading to predominantly Shiite areas in eastern Baghdad. It exploded near Tayaran Square at around 1pm local time, damaging several nearby cars and kiosks. #2: The security forces killed a suicide bomber before detonating a car rigged with explosives in Saydiya district southwestern Baghdad, and defused another car bomb in Zayonah neighborhood, eastern Baghdad , the spokesman for the law-imposing security plan on Sunday. #3: at least five people were killed and nearly 30 wounded by celebratory gunfire after the game. #4: About two dozen masked gunmen also bombed a Shiite shrine that had a reputation for healing powers in a volatile Sunni area north of Baghdad late Sunday, police said. The attack flattened the building and destroyed the shrine. The shrine was guarded by Sunnis and visited by followers of both Islamic sects, residents said. The gunmen arrived in four vehicles and told people living nearby to leave to avoid being hurt. #6: A mortar barrage against a market south of Baghdad that killed one civilian and wounded three others. #1: Three people were killed and two wounded in a fight between two Shi'ite and Sunni tribes on Sunday in Iskandariya, 40 km (25 miles) south of Baghdad, police said. #1: Gunmen killed two policemen in a drive-by shooting in Diwaniya, 180 km (110 miles) south of Baghdad, police said. #1: A policeman was killed and another seriously wounded by unidentified gunmen fire in two separate incidents in northern Kut, a police source in Wassit province said on Monday. #2: Four civilians were injured when their car collided with U.S. vehicle on Monday afternoon on the main road Kut-Baghdad, a police source said. #1: The Multi-National Force (MNF) in southern Iraq said it killed a gunman who was about to open fire at its base in the former presidential palaces in central Basra on Sunday night. #2: A suicide fuel truck bomb targeting an Iraqi army and police checkpoint killed four people and wounded six near the town of Balad, 80 km (50 miles) north of Baghdad, on Sunday, police said. #1: A series of shootings also killed four people in the disputed northern city of Kirkuk and nearby Hawija. The victims included a female official with the Kurdistan Democratic Party, which is pressing for oil-rich Kirkuk to be incorporated into the autonomous Kurdish region despite opposition by Arabs and Turkomen. #1: Three Soldiers assigned to Multi National Force-West died July 26 while conducting combat operations in Al Anbar Province. #1: One woman killed and both her children injured along with one man and a young boy also injured in mortar attack upon Nuab al-Dhubbat district, north Falluja. #2: One policeman stabbed by unknown person and taken to hospital. #1: One person killed in Kafri district, 150 km south of Sulleimaniya and one woman injured in Bawa Khushen village 70 km south of Sulleimaniya by celebratory fire during celebrations for winning the Asia football cup, yesterday. #1: three troopers of Pakistan's Frontier Corps paramilitary forces died in a roadside blast when they were switching checkpoints set up in North Waziristan's administrative capital of Miranshah, the military's chief spokesman Major General Waheed Arshad said. #2: Four more soldiers sustained gunshot wounds when suspected Islamic militants ambushed their convoy in the Datakhel area as they were moving towards Miranshah from the town of Bannu located some 60 km eastwards. Two civilian vehicles plying the road were also caught in the line of fire when the attackers positioned on higher grounds engaged the military personnel using heavy weapons. According to Arshad, there were reports of four civilians being killed in the ambush. #3: In another incident, a remote-controlled bomb was detonated early morning when some army vehicles were moving between the far-flung village of Razmak and the town of Bannu. 'No major damage was done and just one soldier was slightly injured,' he said. #4: Meanwhile, four soldiers were also wounded in an overnight rocket attack on an army camp in Miranshah. The rockets also caused minor damage to the infrastructure. #5: Taliban insurgents ambushed and killed 10 Afghan employees of a private security company in the south of the country on Monday, the interior ministry said. Three other staff of the company were wounded in the pre-dawn raid on a highway in the southern province of Zabul, it said in a statement. The insurgents fled after the ambush, the ministry said. A provincial official said the victims worked for a US private security company. #7: Taliban insurgents stormed a police post in the southwestern province of Nimroz, killing five police and abducting four others, a provincial official said. #8: It is with deep regret that the Ministry of Defence must confirm the death of a member of the Royal Marines during operations in southern Afghanistan yesterday, Sunday 29 July 2007. 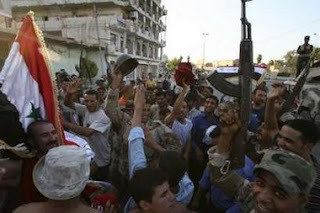 Photo: Iraqi soldiers and residents celebrate in a street in Baghdad July 29, 2007, after their Iraqi team won the final game of the 2007 AFC Asian Cup soccer tournament against Saudi Arabia in Jakarta. They are joyful today, and I am happy for them. I hope many more days of joy come their way soon. And I hope they keep winning their football games (even though I don't care about sports at all)! I hope this joy unites them...... they certainly showed the world how to be the best at football!!! 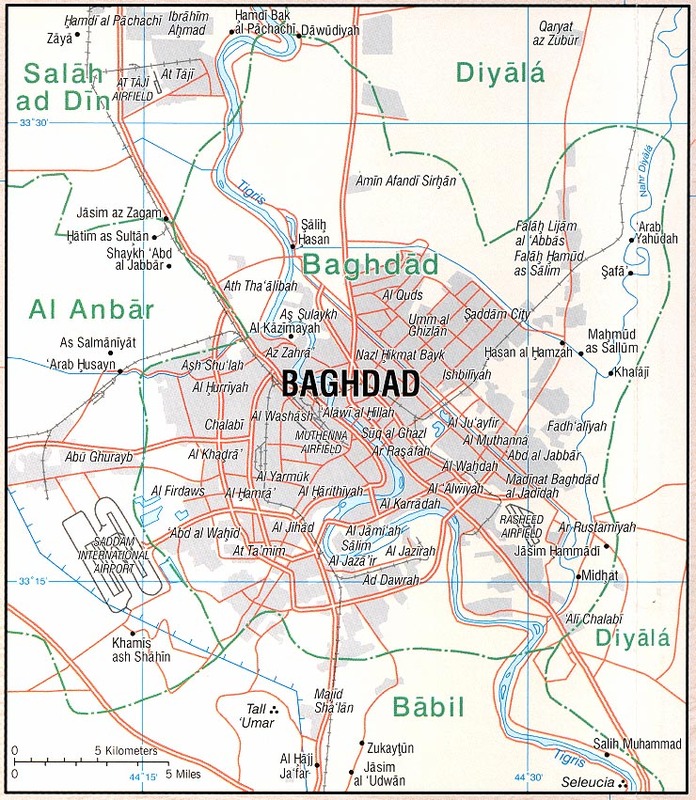 MND-Baghdad soldier killed by small arms fire north of the capital. 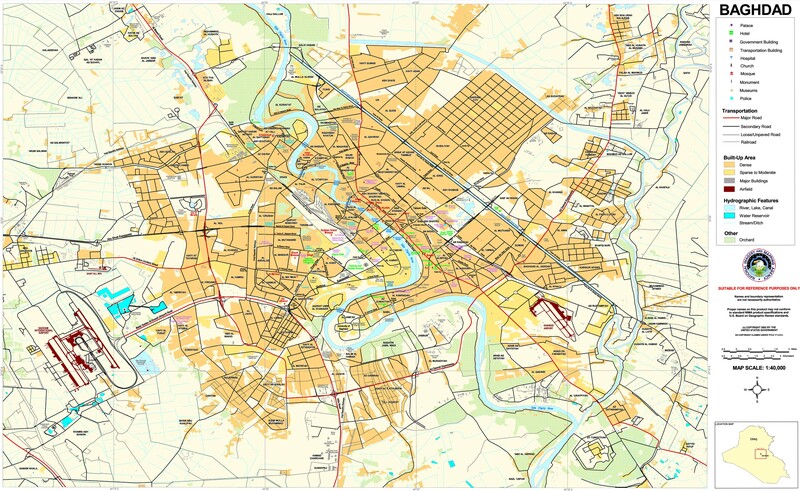 This is datelined Baghdad but may have happened in Diyala. Update: A Multi-National Division-Baghdad Soldier was killed during combat operations in an eastern section of the Iraqi capital July 29. Authorities announce a total ban on all vehicles, including bicycles and carts, in and around Baghdad to try to prevent a repeat of violence in the event of a celebration should the Iraqi soccer team win the Asian cup. U.S. and Iraqi forces deploy to deter incidents, Iraqi forces who join in any celebrations will be disciplined. And an update: The Iraq national team defeated Saudi Arabia 1-0 to take the Asian cup final. Let's hope for a peaceful celebration! One person killed, five injured in mortar attack on French ambassador's residence. All the casualties are reported to be Iraqi civilians who were near the residence. Roadside bomb targeting a U.S. patrol kills three civilians in western Baghdad. Bomb hits minibus in eastern Baghdad, killing one passenger and injuring four. Police man shot to death southeast of Baghdad. (Actually north of Baghdad, unspecified location) Gunmen open fire on U.S. aircraft, which return fire killing three "militants" and injuring a fourth, according to the U.S. military. Iraqi security forces arrested two men in a car filled with explosives in the eastern Baghdad district of Zayouna, police said. The men were accused of waiting to target soccer fans celebrating Iraq's appearance in the Asian Cup final. A roadside bomb targeting an Iraqi army patrol wounded four people, including a soldier, in Baghdad's Zayouna area, police said. Early morning, terrorists attacked Bihbisa village , which is close to Daniel shrine , firing some houses , killing 3 men , kidnapping five and destroying 11 houses which forced some family to displace the area. Around 10 am, a roadside bomb exploded in front of a shop whose owner was supplying people for food ration which had months of delay [sic] killing one man and injuring 25 other at Belad Rouz ( 40 km east of Baquba. Most of the injured are women and children. Around 10 am, three policemen were killed and three others injured when a roadside bomb targeted their patrol near Deli Abass (east Baquba). Around mid-day, a resident of Behrz town was killed when gunmen opened fire a café in the town. Gunmen killed a police man elsewhere in Behrz. Police has two members of Al-Qaeda in custody during a raid on some buildings opposite the police directorate in Bauba admitting of committing many crimes. Police found a dead body at Al-Ameen square (east Baquba) which was sent to Baquba morgue. U.S. forces hunted for a "foreign terrorist facilitator and Al-Qaeda in Iraq leader." No word on whether they found him. Gunmen killed a police officer. All British bases in Basra have come under indirect fire in the past 24 hours, no casualties reported. Basra, Jul 29, (VOI) – Unidentified gunmen blew up the Lion of Babylon statue in central Basra during the early hours of Sunday, eyewitnesses said. "An explosive charge was planted under the statue, completely destroying it the historical monument in Basra," an eyewitness told the independent news agency Voices of Iraq (VOI). The statue, one of the historical landmarks in Basra, 590 km south of Baghdad, was built in the 1920s and symbolized the Babylonian civilization. The Lion of Babylon, large and splendidly carved in basalt, is reminiscent of the legend that the lion was the symbol of the goddess Ishtar, the ancient Assyrian and Babylonian goddess of love, fertility, and war. In the sculpture, the lion's back has marks indicating that it was meant for a precious saddle upon which the goddess Ishtar would stand. One policeman killed, two injured by assailants in al-Shurta neighborhood. VoI reports an ambulance driver killed in a separate attack. Saturday night, gunmen riding two sedan cars penetrated Yankeja village near Tuz Khurmatu (90 km north of Tikrit and 76 km south of Kirkuk) having 12 people in custody and making them stand in one line opening fire on them. Six people were killed and the six others were injured. All of the people are Turkmans. Gunmen opened fire on shoppers, killing seven and injuring six. Not 100% sure this is a separate incident but it seems to be. The source did not reveal the name of the Turkoman leader. 'Eight gunmen were able to infiltrate security barricades manned by Kurdish Peshmerga and fled the scene unscathed,' he said. So, we have three reports of attacks on Turkmen in the same area, all with similar casualty numbers but what appear to be different targets and MOs. All the reports are from different sources. Possibly this was a gang going around doing serial hits? Or garbled reports of the same incident? I wish I could provide more clarity. Thanks as usual to Whisker for the big help. The Iraqi government sharply criticized the country's largest Sunni Arab bloc Friday over its threat to quit the ruling coalition, with the Kurdish president calling the move "unacceptable" and the government spokesman dubbing it "blackmail." President Jalal Talabani also said the Iraqi Accordance Front should have discussed its demands with the country's political leadership in private rather than publicizing them. "It's an unacceptable position," Talabani said in an interview with U.S.-funded Alhurra television, explaining that announcing the demands to the media meant a public spat with the government. He conceded, however, that the Accordance Front's demands were "mostly fair" and acknowledged some government failures, which he did not identify. Prime Minister Nouri al-Maliki's government also criticized the Accordance Front's threat, although the Shiite leader himself issued no public word on the subject. The Sunni Arab bloc announced Wednesday it was suspending its membership in al-Maliki's government for now, but would quit it altogether if its demands were not met in a week's time. The 11 demands include a pardon for security detainees not charged with specific crimes, a firm commitment to human rights and the participation of all coalition partners in the handling of security issues. Government spokesman Ali al-Dabbagh contended the criticism contained many "distortions" and amounted to an attempt to hinder the political process. "The policy of threats, pressure and blackmail is useless," al-Dabbagh said in a four-page statement, which charged that the Front, which has six Cabinet members and 44 of parliament's 275 seats, has contributed to some of the policies it criticized. DAMASCUS, July 28 (KUNA) -- The World Health Organization (WHO) expressed "deep concern" Sunday over the deterioration of security in Iraq that led to the displacement of more than four million Iraqis both at home and to the neighboring countries. WHO's Regional Director for the Eastern Mediterranean Dr Hussein Al-Gezairy was addressing a ministerial gathering in Damascus on the health needs of Iraqis in neighboring countries, adding that despite persistent efforts by the Iraqi government and other concerned parties, the situation in Iraq still inspired worry and fears at the regional and international levels. The Damascus conference that opened today is attended by ministers of health of Egypt, Iraq, Jordan and Syria, as well many international organizations. More than a million Iraqis were displaced at home while other 2.2 million had to leave to Syria, Jordan and other neighbors, he said, noting that the process was on the rise as an estimated 60,000 Iraqi fled the country monthly. He said that the host countries would not be able to carry on with the health services they offered to the refugees who are gradually increasing. The dilemma, according to the WHO regional director, was not only the huge numbers of refugees or the USD one billion needed annually to cover the services they received at the host countries, but it lied in the fact that the refugees included the professional Iraqis, which hits the national capabilities. One of the aims of the Damascus WHO event is to discuss the present challenges facing the Iraqi health sector. U.S. says an insurgent faction called the 1920 Revolution Brigades has "reconciled" with the government and the occupation. It's remarkably common for a grandson to take up his grandfather's major project. This occurred to me when I read recently of Thor Heyerdahl's grandson taking up his mission to cross the Pacific on a raft. But what really struck me was the BBC story aired on July 23rd documenting President George W. Bush's grandfather's involvement in a 1933 plot to overthrow the U.S. government and install a fascist dictatorship. I knew the story, but had not considered the possibility that the grandson was trying to accomplish what his grandfather had failed to achieve. "We Can't Win A War Crime"